Erin O’Toole-Trivas, principal of Parkville Middle School, and Susan Ellerbee, multi-media magnet teacher at Randallstown High School, have been named Region 2 Principal of the Year and Region 2 Teacher of the Year by Magnet Schools of America. 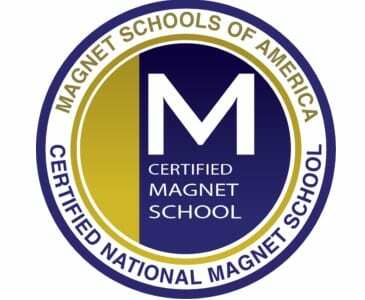 As regional winners in their categories, O’Toole-Trivas and Ellerbee are contenders to be named national winners during the closing reception of the National Magnet Schools Conference in Chicago, on April 28, 2018. O’Toole-Trivas became principal of Parkville Middle in 2011. Among her key initiatives at the school have been implementing Spanish instruction in Grade 6, adding AVID (Advancement Via Individual Determination, a college prep program) and Project Lead the Way (engineering), and instituting efforts to increase student achievement and academic rigor. She began her career with BCPS as a teacher before becoming an assistant principal then principal. O’Toole-Trivas is pursuing a doctorate at Notre Dame of Maryland University and serves as president of the Secondary School Administrators Association. Her educational background includes a bachelor’s degree in secondary education and English from the State University of New York at Plattsburgh, a master’s degree in special education from the College of St. Joseph, and Certificates of Advanced Graduate Study in curriculum leadership and school administration and supervision from Johns Hopkins University. Before teaching, Ellerbee was an Emmy-nominated producer of television news, documentaries, and public affairs programs. Her previous positions include serving as an instructional designer and associate producer for Maryland Public Television, as a producer at WBAL-TV, and as a senior producer/community liaison for GTV (Howard County government’s TV station). Under her direction, students at Randallstown High are producing television and radio shows, a school news magazine, and a school literary and arts magazine. Among her many honors, Ellerbee was named 2016-2017 Randallstown High School Teacher of Year and winner of a 2017 Baltimore County Chamber of Commerce Excellence in Education award. Ellerbee has earned a bachelor’s degree in speech communication from Morgan State University and a master’s degree in communication arts from Montclair State University. Region 2 is comprised of Delaware, Maryland, Ohio, Pennsylvania, Virginia, West Virginia, the District of Columbia, and international members.